My present relationship with my father began a little more than two years ago, when we lost my mother. Since then we have talked on the phone morning and evening, just about every day. I suppose the combination of my being more temperamentally similar to my mother, and my father’s steady fulfillment of his family role as provider and disciplinarian, had made him seem more distant – not absent or uncaring, but more other, the counterpart to her enveloping nearness. Throughout my early life, he was like that promontory on the seacoast which provides a fixed point for the orientation of ships rising and falling on the waves. I think there’s something archetypal about a father, as there is about a mother. Whereas she is the encompassing reality out of which we need to be delivered in our quest for identity, he represents in his otherness the ideal and future goal of what we are becoming. Our fathers might not exhibit the ethical character that inspires our own positive moral formation – although my father truly did – but simply in their otherness they stir our longing to stand out and be somebody. This might help explain why some young men who grow up without a positive role model in their fathers are at higher risk of becoming sociopaths and extremists. Sometimes I wonder if my father’s role in our family system as the lawmaker and disciplinarian kept me from seeing the sentimental and softer side of him. Maybe his life story as a firstborn son and obligated farm hand, eventually serving as a church pastor in a denomination that was strongly patriarchal, shaped his own development away from the more tender and expressive virtues. No doubt, who we are and how we are in the world is to some extent determined by our situation in life and the responsibilities we are asked to shoulder. Even given that, I realized later on that how I saw my father was also limited by my own needs, ignorance, and insecurities. Just last month my father’s only sibling and last remaining family member passed away, leaving him with the solitary task of sifting and sorting through legal documents, family memorabilia, and other of my uncle’s personal effects. He’s remarked more frequently of late how tired and ‘shaky’ he feels, driving back and forth from Michigan to Iowa and having to make decisions over the disposition of property and the family farm. He is struck at times by how little is holding him here anymore, after losing his parents, a son, his wife, friends along the way, and now his only brother. As the anchors of love and commitment are pulled up from his world, he feels increasingly adrift and alone in life. In the midst of it, however, his faith remains strong, which I’m sure is the deep core of his character stability that has always impressed me. While his theology – the vocabulary and discourse he uses to make sense of his faith – is not identical with my own, I resonate with my father’s sense of a provident mystery that is present with him even in his loss and grief. We are not separate from reality after all, and ultimate reality (what we name God) is not ‘something else’ but rather the essential ground in which, as the Apostle Paul says quoting the Cretan philosopher Epimenides, ‘we live and move and have our being’. In his quiet moments, my father finds reassurance that he is not really alone. At first, our frequent phone conversations were my way of keeping in touch and sharing the grief of losing my mother. It was distressing to picture him there, sitting by himself on the edge of the bed or staring through tears at his morning oatmeal. I wanted to be with him, to give what comfort I could offer. Over time, however, it was his faith that ministered to me. He seemed softer, more vulnerable; and in his vulnerability, more genuine and present in the moment. Our connection grew stronger, and I found myself looking forward to the next chance we’d have to talk. Someday I want to be like my father. Why is it so easy for us to take what is precious for granted? When our loved ones are alive and with us, how do we dare let a day pass without telling them how much they mean to us? Why does it take losing them to remind us? I will not wait, not another day. After all, the day might not come. Dad, I love you. Thank you for being a rock for me, and for helping me find my way. By God, What Do You Mean? Real progress in religion is hampered by the fact that its primary concern is such an enigma. What people name “God” – or better, what they mean when they use this term – is nearly impossible to pin down. This is partly due to the inherent difficulty in defining something that admittedly has no boundaries or limits. But perhaps an even stronger factor has to do with the indefinite nature of experience itself, like a moving stream in continuous change. When these two factors (a supposedly boundless object and the dynamic subjectivity of experience) are forgotten, religion becomes a seedbed of dangerous conviction and spiritual oppression. Once orthodoxy is convinced that it has the last word on God, there is no end to what it might muster, justify, or condone in promoting and defending its truth. Well, there actually is an end, once there’s nothing left to burn. In this post I will offer an understanding of religion’s primary concern, specifically exploring how experience, meaning, and truth come together (or fall apart) in this often baffling enterprise. An operating assumption throughout is that our names and representations of God – in other words, our various gods – can never fully or finally capture the reality under consideration. If we can agree on this (and not forget it), then perhaps some constructive dialogue is possible. Even if our depictions of God are different, and significantly so, at least we can learn to appreciate our different depictions as depth-soundings into the marvelous complexity of human experience. Why do we have to put our depictions (as art, story, or doctrine) up against each other for competition and superior standing? Why not celebrate this diversity, claiming it as proof that God is more (and other) than any of us can imagine? It’s interesting how, at the higher levels of theological reflection, God is depicted in such abstract terms and extrapolated to such infinite degrees, that most (if not all) of our differences are logically eliminated. It no longer matters whether we’re talking about the ultimate reality according to Jews, Christians, Muslims or even Buddhists. Once you bracket out the traditional names for the Absolute (referring to what is utterly independent and unconditioned), the reality under consideration is identical. The reason for this remarkable similarity has to do with the inevitable effect of pushing definitions into infinity (e.g., the Divine Absolute as omniscient, omnipresent, omnipotent), which is to erase them or stretch them so far that they no long define anything. By definition, so to speak, the Absolute is beyond definition. Whatever qualities are attributed to it are necessarily amplified to an infinite degree – exploded into everything and beyond. As the Divine Absolute, God is everywhere. If God isn’t in this tree or that cloud, or even in my enemy; if God is only in heaven or on earth, but not in hell – then there is a location where God isn’t, which logically means that God is not everywhere after all. If we are going to reflect on the logical perfection of the Divine Absolute, then anything that is in the nature of God will be without limits, that is to say, infinite. That’s why, at this level of reflection, the differences among our traditional gods dissolve away, leaving only The Unlimited which includes everything but is not dependent on anything for its existence. This capacity for higher-order thinking is a fairly late development in our individual maturation, coming only after we have gained the cognitive functions and language skills to support what Piaget named formal operations, the ability for symbolic and abstract thought. I like to think of this as the “logical refinery” where concepts drawn from experience are stripped of their situational “dross” and changed into pure ideas, or ideals. God, at this level of abstraction, is not a being belonging to this or that tradition, but absolute and limitless Being, that which transcends yet includes existence itself. That’s perhaps why more of us stay in the groove of our religious tradition – belonging to a faith community, going to worship and bringing up our children in the “right way,” studying the scriptures and denominational confessions, believing and behaving as we ought, doing our best to please, flatter, and placate our Patron Deity. The down-shift from a Divine Absolute to a Patron Deity is a step into full engagement with a personified representation of God who has had a long history with “our people” – the insiders, the elect, the chosen ones, the saved. Patron Deity is a more or less technical term taken from the kind of relationship said to exist between the deity and devotee. This relationship is transactional and supported by the mutual exchange of submission for protection, obedience for reward, worship for blessing. Where exactly is the Patron Deity encountered? The answer is difficult for many believers to accept: In the myths, or sacred stories, in which the deity’s character is first introduced and subsequently developed. In other words, the Patron Deity is a narrative construct – the central construct – of a tradition’s mythopoetic (myth-making or storytelling) imagination. Our modern Western loss of this mythopoetic imagination, which was the tragic cost that attended our “gain” in a reductive, objectifying, hard-facts-oriented worldview, required that we “interpret” (rather than recite, embody, and perform) our sacred stories as factual eye-witness reports of supernatural realities and miraculous events of long ago. Yahweh, the resident Patron Deity of the Bible, now must be regarded as existing outside the stories (since story has lost its power), somewhere “out there” or “up there” – in any case, no longer exactly here. In the opinion of many, it is a blatant statement of atheism to even suggest that no one (anywhere, ever) has encountered the Yahweh depicted in our Bible. But in making the statement I am not denying the existence of God, only insisting that the personified representation of righteousness, potency, judgment and mercy – this particular Patron Deity, Yahweh – lives only in the Bible. If it sounds like I’m saying that God is nothing but a fictional figure stuck in the pages of a book, this only exposes how far the modern mind has fallen out of mythopoetic consciousness. Most of us need to go back to early childhood to recapture a dim memory of when stories weren’t just leisure-time entertainment but our full-time occupation. The world we lived in wasn’t made of objective facts. Instead it was suffused with invisible creatures, heroic challenges, time travel, and numerous branching storylines that we might spontaneously follow into our next adventure. Our world was a narrative construct spun out of stories. The characters we encountered, while not literally existing, were real to us – more real than any dead-heavy fact could ever be. Yahweh started his career in the imaginarium of the ancient Near East, among a few tribes of habiru that had settled in the Sinai peninsula. The sacred stories they told brought Yahweh to life, and Yahweh in turn brought their world into existence. So far, then, we have distinguished two very different meanings of God: the theological abstraction of the Divine Absolute, and the mythopoetic character of the Patron Deity. One more step closer to the ground brings us into special settings where God is encountered as a Holy Presence. The sacred precincts of institutional religion (temples, churches, mosques, and cathedrals) are artificial constructions where worshipers gather to call on the Patron Deity and join themselves once again to the timeless realm of sacred story. Typically some kind of ritual performance mediates this crossover from the broken time of ordinary life into the deep time of sacramental experience. Before temple buildings and architectural sanctuaries, people were likely to have such experiences in natural zones like groves, meadows, grottos, seashores, riversides and mountaintops – places where “something more” seemed to come through, activating their sense of wonder, amazement, awe, or even trepidation. This something more should not be confused with something else. The particular name for God at this level – Holy Presence – is often and too quickly reduced to a being (the Patron Deity?) who adds the something more by coming in from elsewhere. As a spiritual intuition, however, this Presence is not added but “unveiled” (or revealed) as always and already there. This dynamic reciprocal support between the Patron Deity and Holy Presence is where conventional religion settles into orbit. Ordinary members are neither interested in, nor do they have the patience (and time) for abstract theological reflection. It’s sufficient to give agreement to doctrines of God’s infinite nature and power and love (etc.) without bothering to chase such statements to their logical (and heretical) conclusions. Indeed your average believer will likely harbor some suspicion towards the “scholars and academicians” who stretch the concept of God beyond what our minds can comprehend. Their preference is for a theology that maintains allegiance to the Patron Deity of their tradition and demonstrates the prestige of their orthodoxy over others. More important than an intellectual exploration into God is the security of knowing that God is here when they need him, and will reward them for their faith and obedience in the life to come. Another direction that conventional believers won’t typically go is downward – which is actually a decisive step inward, to the Grounding Mystery of being-itself. 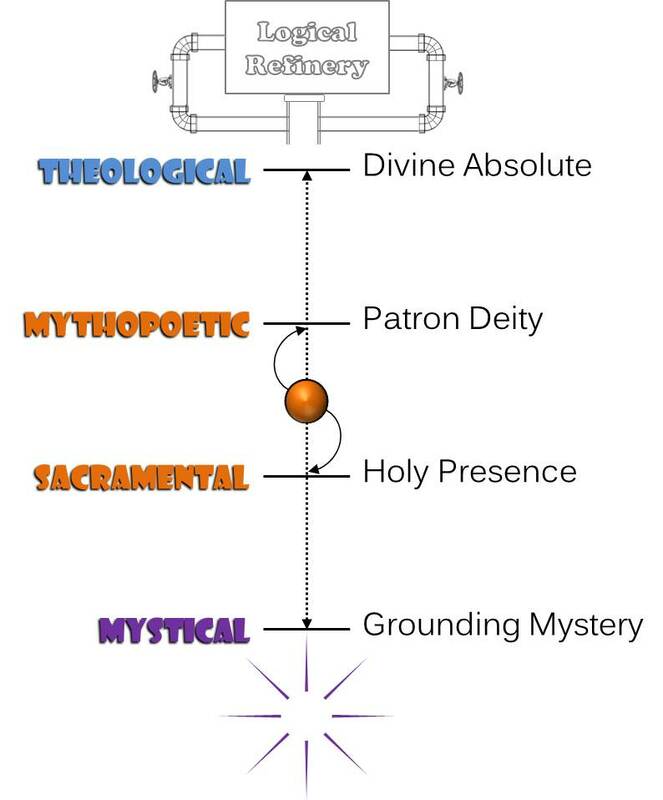 This is where mystical spirituality lives, and its signature experience is essentially the same across (really underneath) all the world religions. It’s similar to theology in the way it pushes language to its limits, but instead of pushing out, mysticism pulls language in to its metaphorical foundations. Rather than an infinite being, God is being-itself, the power-to-be in everything that exists. God as Grounding Mystery is the source and support of all things (as suggested in the metaphor of ground). You will not find this Ground by looking outside yourself, however. 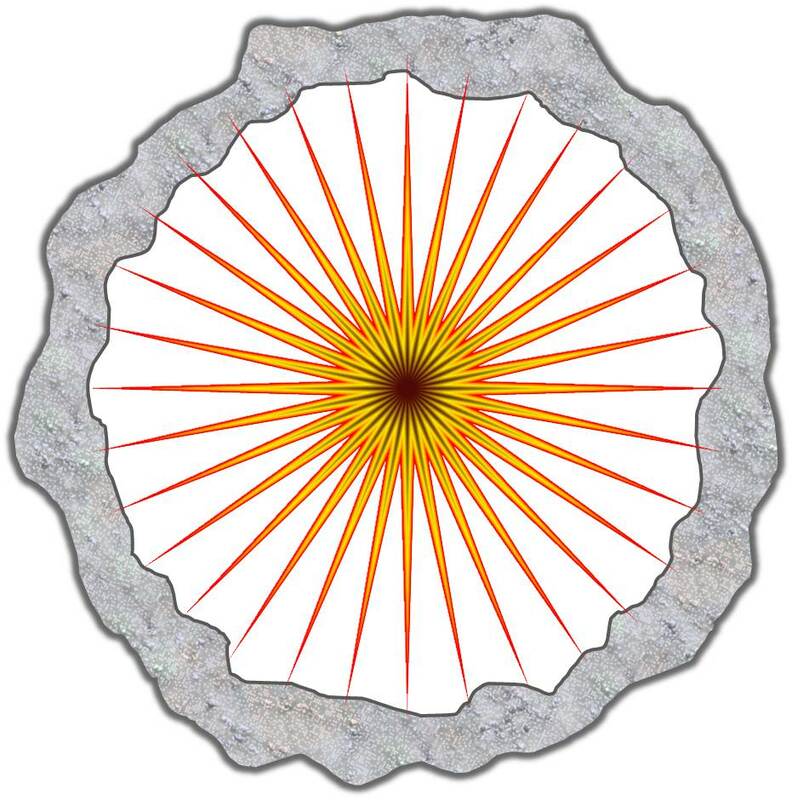 As the generative wellspring of existence, the only path into the Grounding Mystery is within: inward and away from outward attachments, beneath and past the center of your personal identity (ego), down into the place which is no place, where your being rests in and is released to the provident mystery of reality. If language is useful in labeling, classifying, qualifying, and explaining the outer realm, it is gradually surrendered to a silent wonder and profound tranquility, as there is nothing (no thing) for it to grab onto. While my explanation of the distinct levels of meaning for God began in the abstractions of theology and stepped down from there, essential to my theory is the claim that it all really begins in the ineffable (wordless, indescribable) experience of the Grounding Mystery. This is, after all, where our existence is rooted and anchored, where each of us takes in our life and lets it go again, where I am and you are: the only place we can ever be. This is the only place we can ever really be. In his popular lectures on the topic, Joseph Campbell would frequently start out with a definition of mythology as “other people’s religion.” Curiously the assumption of insiders is that the depiction of their god in the sacred stories of scripture came by supernatural revelation, while stories of other deities outside their tradition are quickly dismissed as just mythology. A purely objective consideration of myth across the religions will not be able to distinguish which stories were “revealed” (by god) and which were “produced” (by humans). The god of our Bible is not less violent or more merciful than gods we can find in stories elsewhere. But even in the polytheistic age of the Bible when other gods were acknowledged if not honored and worshiped, we find this tendency to regard other people’s religion as generated out of ignorance rather than by illumination. So let’s stay with the Bible for now, and ask why so many believe in the existence of Yahweh*, the patron deity of Jews and Christians. The popular assumption, once again, is that they believe in Yahweh’s existence because the Bible (the principal resource of Judeo-Christian mythology) contains historical accounts and eye-witness reports (encounters, sightings, and auditions) of the deity. Yahweh created the cosmos, liberated the Hebrews from Egypt, revealed himself to the prophets, and sent his son for our salvation. These things are taken and accepted as facts – historical, objective, and supernaturally validated. What I’m calling the supernatural validation of biblical stories can be analyzed into three closely related but independent claims. First, the Bible is an inerrant resource for our knowledge of Yahweh. Every word – or in a softer variant of the inerrancy doctrine, the intention behind every word – is the revelation of Yahweh to those he elects to save. To prove Yahweh’s existence by appealing to the Bible as his infallible revelation to us is an argument of obvious circularity, so we hasten on to the next claim, which is that the Bible records literal accounts of Yahweh’s self-revelation to people much like us. This is how to escape the fatal circularity of the inerrant Bible argument: Because the stories of the Bible are factual reports of events in history, however miraculous and supernatural, the real anchor for our knowledge of Yahweh’s existence and character is human experience. Prophets and visionaries, but also average folks like you and me, were granted the privilege of divine visitations and apocalyptic visions. They were actual witnesses; their accounts were taken down with perfect accuracy and provide us with what we know about Yahweh. If the biblical stories were not grounded in actual events outside the Bible, they would be nothing more than … well, myths. Even with that critical move, however, believers are still on shaky ground, for how can we know that these historical “revelations” were not really hallucinations of something that wasn’t there? So-called ecstatic experiences (e.g., clairvoyance, glossolalia, out-of-body experiences, “hearing voices”) are observed among patients in mental clinics and state hospitals around the world today. I suppose it could be argued that these are the true charismatics of our age, though tragically misunderstood and wrongly diagnosed. But who’s to say that those visionaries behind the Bible were not mistaken or mentally disturbed? To answer – and effectively silence – this question, the third and final claim for the supernatural validation of our knowledge of Yahweh is that these visionaries didn’t just “see things,” but that he showed himself directly to them. Authorization for the orthodox doctrines concerning god’s nature, character, attributes and accomplishments therefore transcends both the Bible and human experience. The argument is thus that (1) Yahweh exists (out there as a separate being) and (2) revealed himself to people much like us, who then (3) recorded their experiences and facts about Yahweh in the inerrant resource of our Bible. Even though Yahweh isn’t speaking out of burning bushes, parting water, multiplying loaves, or raising dead people back to life anymore, the faith of a contemporary true believer is measured by how willing he or she is to simply trust that the same deity is out there, watching over us, and getting ready to ring down the curtain on history. But what if Yahweh doesn’t exist – and by “exist” I mean out there as a separate entity, “above nature” (supernatural) and metaphysically real? What if no one has ever encountered this deity in the realm of actual human experience? What if the Bible isn’t a factual record of extraordinary encounters and miraculous interventions? What if, that is to say, Yahweh is a literary character, the principal actor and prime mover in the collection of stories that shaped the worldview of Jews and Christians – but not a literal being? Of course there are people today who claim to have had personal experiences of the biblical deity – or any number of countless other gods and goddesses, spirit guides, angelic or demonic beings, fairies and departed souls. Perhaps because we want to hold open the possibility of higher dimensions to existence, or because we can’t conclusively disprove their reality, or maybe we don’t want to come across as judgmental, simple-minded or faithless, we let the popular discourse continue unchecked. Who knows, but perhaps these individuals are genuinely gifted. Could they be seeing and hearing things from which our ignorance or skepticism prevents us? Someone has to say it, so I will: No. Metaphysical realism – belief in the existence of independent realities outside the sensory-physical universe – was the inevitable consequence of mythological literalism. When the myths lost their tether to sacramental celebration, ritual reenactment, and the contemplation of mystery, they floated up and away from daily life to become “timeless” accounts, ancient records, and long-lost revelations. But before they were taken literally, while they were still serving as drama-poetic expressions of experience and the narrative structure of meaning, myths were fictional plots bearing the life-orienting metaphors on which human security, community, and the shared search for significance depend. The stories of the Bible are indeed myths (from the Greek mythos, a narrative plot), not to be taken literally but engaged imaginatively. Much of the worldview they promote and assume is out of date with respect to our current science, politics, ethics, and spirituality. At the time of their composition, the biblical myths were very similar to those of other tribes and traditions, but with Yahweh (rather than some other deity) as the metaphor of the community’s dependency on the earth, its place among the nations, its origins and destiny, and its moral obligations. As human culture evolved, so did Yahweh. Indeed, one of the principal functions of a deity is to model (in example and command) the preferred behavior of his or her devotees. The storyteller is sometimes at the leading edge of this evolution, as when a minority voice among the prophets began representing Yahweh as unimpressed (even offended) by the sacrificial worship of his people, demanding instead their care for widows, material help for the poor, and inclusion of the marginalized. Later, Jesus of Nazareth gave the wheel of evolution another turn when he began to tell stories of Yahweh’s unconditional forgiveness of sinners (love for the enemy). At other times, those telling the stories and thereby controlling theology were motivated by less noble, even base and violent impulses. Yahweh’s wrath and vengeance as represented in the myths subsequently provoked and justified similar behavior in his devotees. Depending on what you are looking to justify in yourself or get others to do, chances are you’ll find Yahweh endorsing it somewhere in the Bible. I’ve defined myths as fictional plots bearing life-orienting metaphors and shaping our view of reality, with the deity chief among these metaphors. Rather than looking outside the stories for facts that might establish their truth, I’m arguing that we need to look deeper inside the stories to the human experience of mystery and our quest for meaning that inspired them. 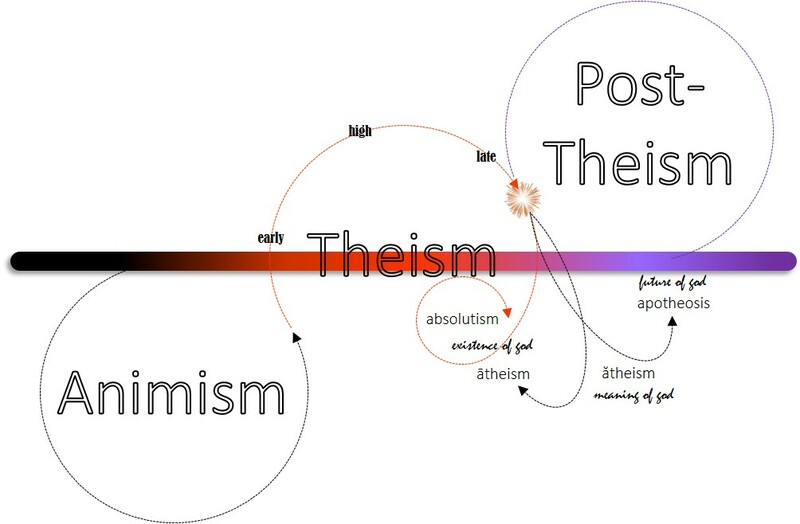 Theism insists on the objective existence of god, while atheism rejects it. Post-theism is our growing awareness that the argument, one way or the other, just might be distracting us from the real challenge at hand. *In reading the name Yahweh, and throughout the continuing scriptural tradition, a title (Adonai, The Lord) was used in its place as an expression of reverence. Religion didn’t just fall out of the sky fully assembled but evolved over many thousands of years. It emerged as a way of securing the everyday world of human concerns to the deeper mystery supporting all things. The experience of this mystery – what I call the present mystery of reality, or Real Presence – is engaged spontaneously and at a level below the reach of articulate thought. For this reason it is properly named “mystical,” available only to contemplative attention and essentially ineffable (beyond words). If you observe anything for very long, the subject-object screen separating you from the thing observed can sometimes fall away to the realization that both you and that thing are grounded in one reality. This breakthrough to oneness doesn’t negate what makes you different from that thing, but instead helps you see beneath the difference to your co-presence in being. You are being in human form, and that other thing is being in a different form, but it is being-itself presenting (or presencing) as both. Now, this doesn’t sound very religious. It would be some time before our minds developed the philosophical acuity to think into such abstraction. In the dawning age of religion, the first efforts at representing this experience of mystery were perhaps through rhythm, song, and dance. Gradually icons, artistically crafted images in paint, wood, clay, and stone, qualified the mystery in visual terms. Such sensory-concrete images were eventually transmuted into conceptual metaphors and put into the framework of narratives called myths (from the Greek for plot). Elemental metaphors (personifying the forces of nature), theriomorphic metaphors (represented in animal form), and finally anthropomorphic metaphors (taking on the features and personality traits of humans) provided ways of converting an ineffable mystery into something increasingly more personal and relational. The myths of religion tell of the exploits of this or that deity, how the tribe is related to, dependent upon, and/or commissioned by the will of the deity. If Yahweh (the patron deity of Jews and Christians) made the universe, intervened on behalf of Hebrew slaves, spoke to the prophets, and miraculously lifted the dead Jesus back to life, then why doesn’t he do similar things for us today? Typically, literalists will guard their orthodoxy by laying the responsibility on us, saying that our age has become sinful, perverse, secular and faithless. Consequently god has abandoned us to our wicked ways and withdrawn into heaven, or we have lost the ability to feel, see, and hear god. It might also be that everything god has to say has been said, everything needing to be done has already been accomplished. Now all we need to do is believe. For your own good you are admonished to heed the “experts” – teachers, pastors, clerics, bishops and theologians who are professionally committed to the tradition and its orthodox heritage. Don’t question the Bible, don’t challenge the preacher, and by all means don’t try to work it out for yourself. The end of the world is at hand and you can’t afford to rely on your own judgment. If your soul is to one day see the bright streets of paradise, you’d better listen up and stay in your seat. A large number – perhaps the majority – of those professional custodians of religion don’t believe what they preach, not really. Many of them came to their credentials by way of denominational training that likely included a critical study of Christianity, its historical place among the world religions, as well as the evolution of the Bible and its competing representations of God. From the pulpit they proclaim with authority what they privately doubt and discuss over coffee in their closed circle of peers. I know. I lived in those circles for nearly two decades. What these professionals know is that God is more than what can be said. The discrepancy between our representations (god) and the reality (God) they qualify is so impossibly vast that our images, thoughts, and talk about God are like scratchings at the surface. “Standing on a whale, fishing for minnows,” as a Polynesian saying goes. Our concept of God is our first idol. But don’t tell the people. They can’t handle the real truth, so we spoon-feed them from the cramped little boxes of stale theology we push to the side during the rest of the week. If God (the real presence of mystery) is more than our words and images can express, then we also need to admit that the reality of God may be other than what we believe. In short, we just might be clinging to an idol that entirely misrepresents the present mystery and is actually preventing us from a genuine experience of God’s presence. 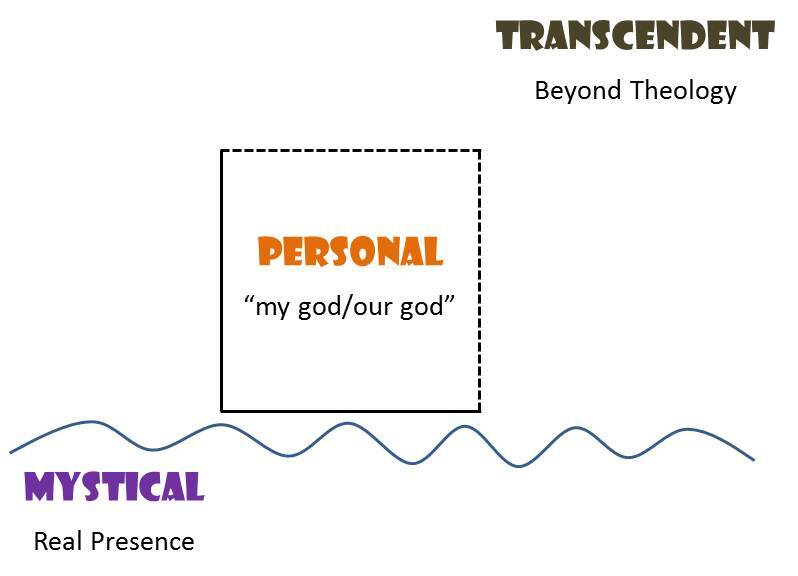 The transcendent God is transpersonal – beyond personality, more than we think, other than the patron deities we worship, obey, and promote. It’s important to understand that we are not talking about the hidden nature of a god out there whose actual personality is inscrutable to us. God’s transcendence is another way of saying that our representations of God are merely qualifications on something that cannot be named or known objectively. You don’t leave behind the patron deity in order to look still farther out for a bigger and better god. Acknowledging the transcendence of God means letting go of your beliefs about god in the interest of coming again (or for the first time) to the Real Presence of mystery here and now. First your grip is relaxed, then the screen falls away. You wake up to the realization that the creative source and gracious support of all things is all around you, right here with you, and rising up from deep inside you – just as you are.